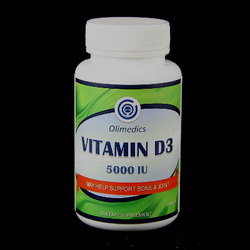 ​Vitamin D deficiency is now linked to various forms of cancer including malignant melanoma and colon cancer. Vitamin D deficiencies can also drastically weaken the immune system, bones and brain function. For these reasons many physicians are now recommending their patients take levels of Vitamin D far in excess of the recognized Daily Value. This product is manufactured and packaged in a facility which may also process milk, soy, wheat, egg, peanuts, tree nuts, fish and crustacean shellfish. KEEP OUT OF REACH OF CHILDREN. DO NOT USE IF SAFETY SEAL IS DAMAGED OR MISSING.STORE IN A COOL, DRY PLACE. Other ingredients: Di-calcium phosphate, microcrystalline cellulose, vegetable stearic acid, vegetable magnesium stearate, silicon dioxide, croscarmellose sodium and pharmaceutical glaze.